Arriving at West Kirby in the dark on Friday was a pleasantly surprising experience with the lights all over the industrial petroleum plant making it look like an early Christmas tree. On arrival at the club we were all made very welcome with the race officer seeking me out and buying me a beer, being encouraged to join in the quiz and having the wonderful surprise of Sir Bazza Steel coming up to spectate which rarely for a sailing event was going to be very easy for the greatest fan of the RS300. Beer sunk, great food and company: the first night was complete and it was time to focus on the sailing. The forecasts were at best confused but all that really mattered was the dawn chorus was stirred by brilliant sunshine and a few bubbly clouds. The water however had not yet arrived because in these parts the tide is pretty fast. Add to this what the locals described as "dark sand" for many a mile to be seen. So the first boat was launched onto this mysterious sand and looked positively abandoned with the water well off in the distance. Clearly it was a local abandonment and within 15 mins the water was here along with a gentle force two from the North West. Everyone was now salivating at the chance to sail in some waves and a proper tide so we all got launched and sailed to the start area promptly. On arrival it was clear the tide was going to run fast all day with it being slack for about 5 mins before turning. This made the course a bit one-sided but made for a very entertaining start line. If there was no tide it was port biased but everyone squashed into the committee boat end trying to go right as fast as possible to the shallows. Paul Watson after too many slow starts to an event had made the conscious decision to start bang on. Sadly for him he was about two boat lengths ahead of himself so did a quick u turn. Chris Massey (Mr point through the eye of the wind) had clearly been taking lessons from Dave Acres and was flying upwind, but it was clear the right was going to pay with so much tide and the wind gently building all the way up the first beat. The Purple missile (Richard Le Mare) had sussed this from the off and tacked asap off the line and did a Bolland by going massively into one corner. Harry M6 McVicar had not even started yet as the M6 had better ideas, but fair play because with any RS300 sailor tenacity is the key. At the top mark the pack following LeMare looked tight and everyone was treated to the perfect RS300 reaching angle right across the bay. There were whoops and smiles everywhere as the champagne gods looked down favourably on us. Force three, sunshine reaching in an RS300 = life doesn’t get much better with you clothes on 😊! Once gybed and back at the bottom mark it was a really tricky beat to the finish area to wave at Harry sussing it all out and onto lap two. Chris was still there flying upwind but LeMare was getting nervous because after the upwind came the run which is manna from heaven for the lightweights. All the lightweights were stretching their toenails upwind while the Purple missile was in energy saving mode for the run. Interestingly the wind had still been building along with the waves and now the run had turned into a perfect run. Just enough wind to pump into the wave and waves just long enough to surf and if you found a set of waves whooop whoop. The Purple missile had managed to extend just enough to maintain the lead by the leeward mark, but with the tricky little beat at the bottom created a real challenge to the grey matter with tide and angles to be allowed for and with a hard-charging Chris in his grey boat Le Mare just managed to hold on for the win, with Chris second and Premature Paul coming back up to third. The following pack was close with some really close sailing positions swapping almost on every wave set. Steve Salis in his grey boat 4th and Storky (Alistair McLaughlin) 5th. The second race followed a similar format, but with a notable exception the Purple missile was tiring fast and Paul Watson in his grey boat was bang on the line and flying upwind and with a fresh Harry in his grey boat (ihgb) these two were rather determined to not let LeMare have his way again. Paul won, Harry was second and LeMare managed to hold onto third. The turnarounds between race were exceptional with Cheryl ihgb not getting much recovery time at all but still whooping with glee around the start line. Race three and the tide was turning so LeMare who was still using the Bolland technique of hitting the corner hard found it didn’t work and was dropped right down opening up the leader board beyond belief. Paul was now properly in his stride and horizoned everyone with Harry chasing as hard as possible, but Paul was just too quick upwind. Alistair Wood (the furthest travelled) in his half purple boat (hpb), what a relief to have some colour in the fleet, had chosen to get a cheeky practice in on the Marine lake which was planned for tomorrow. The racing mid-fleet was amazing with positions again changing on every set of waves. If you caught a good set you could pull out four to five boat lengths, so there was no rest for downwind for sure. Relaxing on the patio with a beer in hand watching the sun slowly set across the water was perfect recuperation. This was then topped with the exceptional welcome from WKSC as extended to us was an invite en mass for a social for the trainers. A decent band and beer flowed freely along with a cracking chilli and Thai veg curry topped off a lovely evening. Day two dawned with Sir Barry egging us all on taking many pictures and even a short video from the shore on his phone (of which any professional would have approved!) because we were so close to the shore all time in the marine lake. This lake has a walkway all the way around it giving opportunity for those brave enough to get close to the edge to high five walkers-by. Cracking amphitheatre sailing was to be had. It has to be said there were a lot of nervous comments being made at launch time along the line of wall magnets and who has rights once room called. The scene was set for race one with a good force four and a lovely gybing course the full length of the lake. 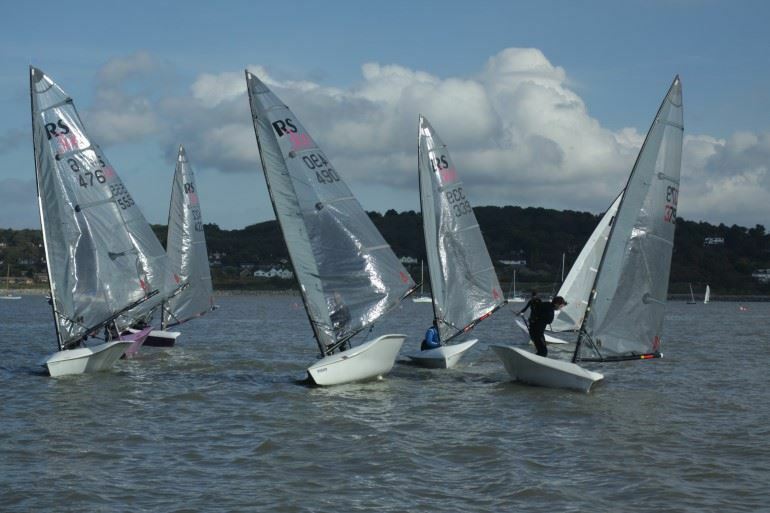 It did mean 16 gybes though with some from port to starboard not often an RS300 manoeuvre and so adding to the nerves. LeMare spotted the port line bias and pounced as he loves a bit of bias .. it did mean a very quick tack though shouting the entire fleet for room which got varying amounts of response mostly Dan Skinner ihgb being gutted not to catch LeMare on starboard forcing the tack back to the wall. 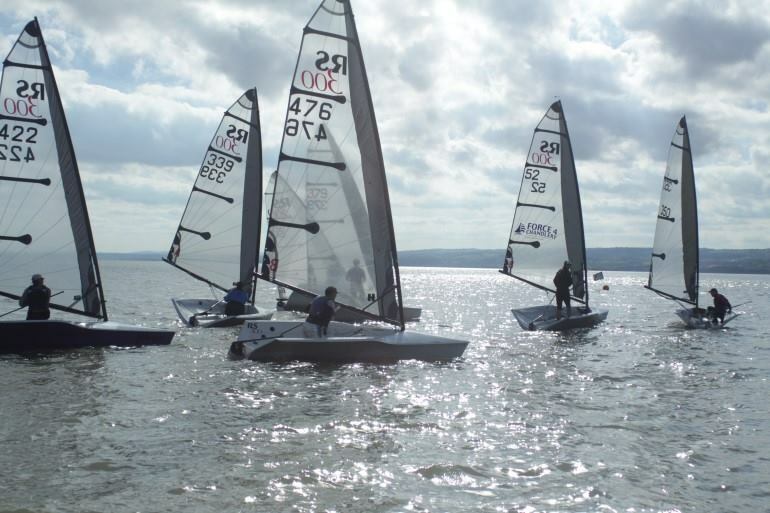 First mark and the Purple missile was revelling in the conditions of flat water and lots of wind making for fast upwind sailing. Sadly the others itgb didn’t seem to be able to keep up, but Paul Watson was chasing hard doing his best followed by a rejuvenated Harry now he was on time. After the first lap and lots of full on gybes the grins were growing across the fleet and Chris was pointing really high on this inland sea. I reckon a 12 meter would struggle to point as high as Chris! Must be all that Scorpion sailing at Hollingworth. After three laps Richard had cleared off, being totally unsociable, followed by a far more sociable finish between Paul, Harry and Chris. 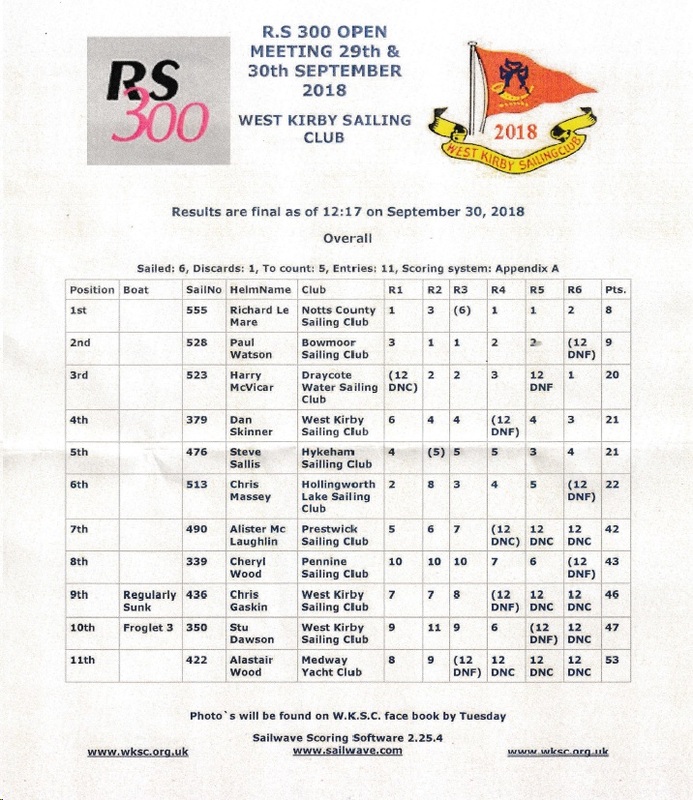 A hard-chasing Steve Sallis was next, then the local tidal guru Stu Dawson and a great result from the seriously tenacious Cheryl whose mastery of the RS300 in these sort of conditions was improving dramatically. Onto race five and a slight change to the course with only two gybes now. Still these two gybes were to cause just as much hassle. Race five and Purple missile found the pin again and room was called. Dan was noticeably closer this time, but was just astern phew! A knowing laugh though meant the third time LeMare may need to be a little more cautious. He went off down the now easier to manage run and extended on the rest of the fleet enjoying the sunshine and breeze and flat water. Unfortunately it wasn’t so flat up front as the very kindly laid on rib to draw the course was creating a real challenging wave on the reach and bows were going under and popping back up all over the place. Still it helped with the gybe because picking the right wave made it super easy. LeMare was being antisocial now disappearing as the battle behind was hotting up between Paul and Steve with Harry having to disappear to change his tiller extension for one with a working UJ. Dan had really found his form now too and was right in the mix maintaining the 4th he seemed to like. What really was wonderful was to hear sir Barry’s dulcet tones encouraging everyone from the shore at the leeward mark so much so that Cheryl got her best result ever and was so pleased. Start of race six and Purple missile found the pin yet again and room was called Dan was noticeably closer again but was just astern phew! Top mark approached and Chris “eye of the wind” Massy was right there with Paul and Richard screaming off on the reach pretty much nose to tail. All three rounded the gybe mark safely, as did everyone from memory, then the deeper run gave the lighter weights a chance again downhill. The purple missile was really glad of the Speedsix he had applied because it just kept him sliding ahead at the bottom mark but with no room for complacency for sure. Off upwind again and the missile was in the groove again leaving a decent gap. The trouble was that the wind had built even more and so we were definitely the other side of a steady 20 knots now and the gybe loomed. Bear away complete three other boats not that far away and the mother gust saved itself for the leading pack. Like a scene from the movie three Spartans were felled as Valhalla did his best 1 2 and 3 all over 4 chicken gybe and shot though the three of them. Well that really changed the leader board and it was a real race to get up and finish with a better discard between Paul ihgb and Richard in the purple missile. Both were nose to tail going round the bottom mark while Harry had cleared off with his added wisdom from his new borrowed tiller extension, not making any mistakes and if the wind got up tacking while others risked the gybe. Just in front of Richard were Dan and Steve and he had to pass them to be sure of winning, Dan went for the last gybe in a do or die moment and was heard cackling with joy “made it” but then his boom just skimmed too much water and tipped him in again. Richard went for a safe over-gybe and nailed it. One down one to go but then he couldn’t get born away again as quickly as Steve could and rounded the last mark in 4th . He did however manage a sterling job of trapping both Steve and Dan on starboard round the leeward mark and then tacked to take second along with the overall victory. Wow what an event: brilliant sailing, fabulous company and superb venue. If you’ve never sailed there before it’s well worth it. The challenge of the tide mixed in with the inland saltwater is a real sailor’s treat! For goodness sake a windsurfer has topped 50 knots there (http://jp-australia.com/2018/blog/jacques-west-kirby-record/ ) A huge thanks to everyone at the club for making us feel so welcome: Kay Eggleton and Peter Bramley (event organisers), Jean-Louis Simmons (race officer with great turn arounds and spot on courses), Graeme Nicolson (beachmaster and rescue), brilliant photos from Alan Jenkins, and Mike for sorting us and welcoming us to site parking and rescue. If you would like us back as a fleet we most would love to come Mr Commodore John Burthen! Thank you to one and all, sorry if I missed anyone. 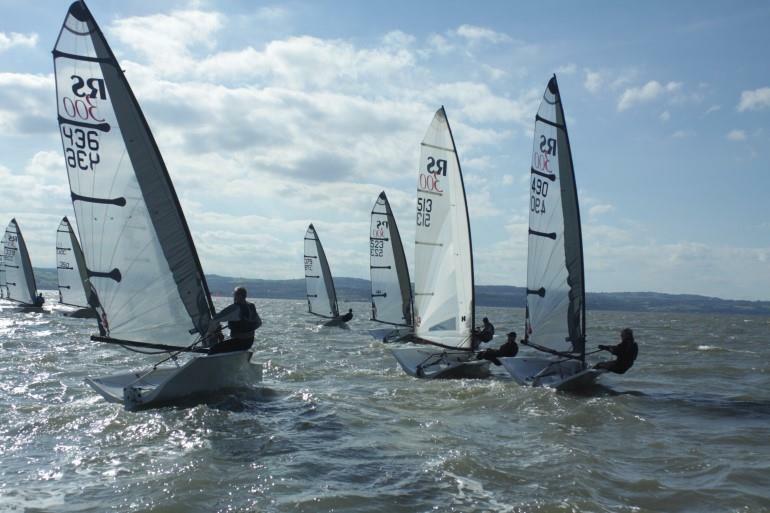 Next up is the RS300 Inlands at Alton Water SC 20-21 Oct, which will be RS300 Rooster National Tour event number eight.